Catch the Flu last year? Blue Cross Pharmacy will be vaccinating from the 19th of March, walk-ins may be available on the day, but to ensure your spot book an appointment. Vaccinations are available Mondays and Tuesdays from 1pm-5pm, and then Thursdays from 8.30am-5pm. Sundays are available by appointment only. Please allow for 15 minutes observation time after the vaccination. Flu vaccinations at Blue Cross Pharmacy are available by appointment on Mondays and Tuesdays from 1pm to 5pm and Thursdays from 8am to 5pm. There will be walk-in time slots available. In addition, there will be some Sundays available by appointment. The cost of the flu vaccination service is $14.95 for all Blue Cross Pharmacy loyalty members, the price for non-members is $19.95. Signing up for the Loyalty program is quick and easy! Click here for more information about the program and how to sign up. 5 years and over with medical risk conditions. Aboriginal and Torres Strait Islander from 6 months of age. Over 6 months old to less than 5 years. Please be aware that if they have not had a flu shot before then they may need 2 shots (1 month apart). Did you receive the Flu Vaccine in 2018? Did you catch the Flu last year? Nationally the 2018 influenza season had the lowest rates of infection since 2013, this is partly due to a record vaccination uptake in 2018. Nearly 11 million Australians received the vaccination, an increase of approximately 25% from previous years. Having the flu vaccine continues to be the most important measure to prevent influenza and its complications. The vaccination may not always prevent you from becoming unwell but it can still help to reduce the severity and/or duration of influenza. It may also potentially prevent further serious complications, including pneumonia and going to hospital. Vaccination is recommended for anyone who may transmit influenza to children or adults at increased risk of influenza complications (e.g. parents of children with medical conditions and healthcare workers) and those travelling during the influenza season. Vaccination is the most effective protection against the Flu. Who will give me my Flu Vaccination? Your Flu Vaccination will be given by one of our trained Pharmacists, Clair, Chris or Elein. There is no need to see a doctor to get a script first, the vaccine will be administered in-store in a safe and professional environment. Who can be vaccinated at Blue Cross Pharmacy? 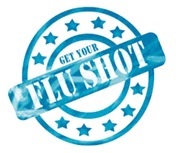 Blue Cross Pharmacy flu vaccination service is for adults over 16 years. The Pharmacist will assess you on the day to make sure the Flu Vaccination is suitable. Yes, but only a little bit. You may have a sore arm and redness for a day or two afterwards. NO. There is no live virus in the flu vaccine, so you cannot get the flu from the flu vaccine. I had the flu vaccine last year, do I need to get it this year? It is important to get the vaccination every year, as the virus changes each year. In addition, the protection from the previous year’s vaccination diminishes over time. 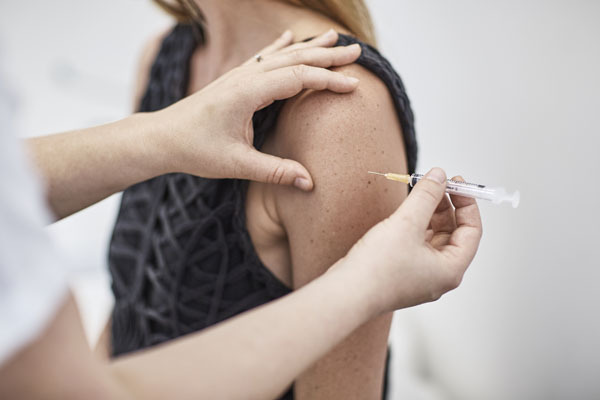 The 2019 vaccine recommended for under 65 years old is a quadrivalent vaccine, protecting against two influenza A viruses and two influenza B viruses. The over 65 year old recommendation is a specifically designed Trivalent vaccine that produces a higher immunse response . The best time to get vaccinated is from April to May, before peak flu season which usually occurs between June and September. Protection from a Flu Vaccine does not occur immediately, it can take approximately two to three weeks. We ask that you allow 20 minutes for your vaccination as you must remain for 15 minutes afterwards to observe for any adverse reaction to the injection. Most side effects are very mild and short term (normally lasting no more than 48 hours). They may include drowsiness or tiredness, muscle aches, localised pain, redness and swelling at the injection site, an injection-site lump (a nodule that may last many weeks but needs no treatment) and low-grade temperature (fever). Very rarely an allergic (anaphylactic) reaction may occur to the vaccine. Blue Cross Pharmacy is located adjacent to Blue Cross Medical Centre so that if there are any concerns after the administration of the vaccine, there are Doctors and Nurses on site ready to assist. Are you able to let my GP know that I have received the vaccine? Yes, we are required by law to notify your nominated GP. Your vaccination record will also be uploaded to the Australian Immunisation Register. Please bring your Medicare card as we need this number to upload your record into the Australian Immunisation Register. You can make an enquiry or book an appointment via the form below.